At our office, we provide the latest and most innovative denture technology with PalaDentures. After the initial impressions, your dentures will be scanned and designed on a 3D printer and custom fit to your liking. (giving you a natural and younger appearance). A Complete Denture is placed in the patient's mouth after all the teeth have been extracted and the gum tissue has healed. Healing takes anywhere from a few weeks to a few months, depending upon the patient. An Overdenture usually requires that at least 2 roots be kept. These roots may be used to hold the denture in place by placing inserts in the roots and in the denture. The denture then attaches to the roots. These roots also give support to the denture and help retain the ridge the denture sits on. An Implant-Retained Denture is similar to an Overdenture, but uses implants as anchors. An Immediate Denture is placed the same day the teeth are extracted. 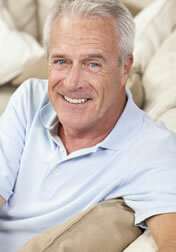 The advantage to an Immediate Denture is that the patient does not have to be without teeth during the healing period. A Partial Denture or "removable bridge" replaces one or more missing teeth, but there must be teeth remaining for the partial to attach to. Unlike a Fixed Bridge, a partial is removable. A partial will prevent other teeth from shifting, preserving your remaining teeth. Dr. Fattahiwill evaluate your condition and needs to help you determine the option that is best for you.